Hawaii is a state of the United States (since 1959), but since it’s so far from the mainland both geographically and culturally it gets its own entry. It is an archipelago of hundreds of volcanic islands, of which the eight are known as the main islands. Only about 10 % of the people are Pacific Islanders and black/African-American form the largest ethnic group. It is a popular tourist destination, especially for Americans but also the Japanese. While the lifestyle is quite similar to North America, Polynesian religion and myths are still observed. As could be expected, the Hawaiian cuisine has been influenced by many other cuisines, including American, Portuguese, Polynesian and several Asian cuisines. Typical ingredients include taro (a starchy root), sweet potatoes, cabbage, coconut, breadfruit, candle nuts, jicama, arrowroot, mango and papaya. Pork is very popular, especially in the form of spam, which is a part of many different dishes (eww). Of course seafood is eaten too. The spices are quite Asian-influenced, including wasabi, soy sauce and five-spice. A typical “plate lunch” features rice, macaroni salad and some type of meat. A papaya bread that sounds like carrot cake but with some papaya in it? The recipe from About.com sounded very nice. However, I baked it slightly longer than instructed and tested it, with a toothpick but when cooled it turned out to be quite raw (I use an oven thermometer). :-/ Could have been more moist fruit? As such I’d recommend baking the cake longer than instructed in the original recipe (55-60 minutes), unless you’re really sure it’s done. But besides the texture, the flavour wasn’t all that impressive either, IMO. You can’t really taste the papaya, so it tasted like carrot cake, but I’ve had better carrot cakes. The original recipe made two cake loaves, this is halved and makes one. Preheat the oven to 320F/160C (please do check that your oven correctly warms up to this temperature – in low temperatures like this even a bit cooler can mean it’s never done!). Grease or spray a large loaf pan. Combine sugar, oil and egg substitute. Mix on low speed for 30 seconds. 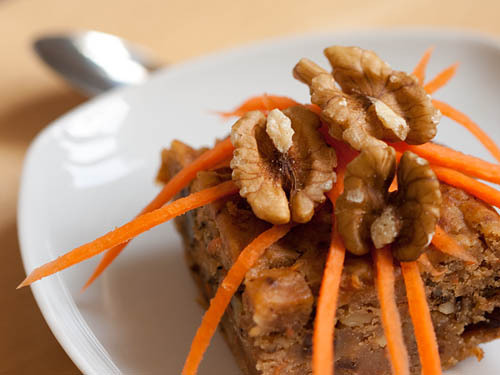 Add the carrot, fruit sauces and walnuts. Again mix on low speed for 30 seconds. Mix the dry ingredients (all the rest) together. Add to the wet mixture and mix by hand until combined. Spoon the batter into the prepared loaf pan. Bake for about an hour (see the notes). Let cool for at least 10 minutes, then remove from the pan and cool on a wire rack. This entry was written on June 30th, 2011 by Maija Haavisto and filed under Baked goods, Desserts and sweets, Oceania. Ooh that sounds absolutely delicious! I love everything that you put into this. I think I’ll buy some papaya just to make this bread. I love the idea of papaya but can’t get organic papaya here right now. What would you suggest to use–apricots just coming into season, peaches and nectarines a month or so away or some kind of vegetable? I would suggest mango or guava, but I have no idea if their availability is any better. Persimmon would probably work too, but may not be in season (they’re slightly more water though, I think). Apricots would probably work nicely, though they have very different flavour. Fresh papaya does contain some protein-digesting enzymes (unlike most fruit, except for pineapple and kiwi), but I don’t think they’re relevant here. They are killed quite quickly after the batter goes in the oven, anyway (and if they did make a difference, I assume the recipe would mention the difference between fresh and canned papaya). I’ve actually never baked with papaya before. This sounds like as good a place as any to start- The bread looks so delicious!